Never Enough Nails: Lynnderella Spring Things Swatches, Part 1! Well my hand is starting to feel a bit better, so I finally have a new post for you today! Now that the weather is warming up, I've been wearing some of Lynnderella's spring polishes and they are gorgeous! Lynnderella Are Those Eggs Holo? has rich grass green glitter with green holo glitter and larger pastel and bright glitter accents. Some of the larger accent glitters are my favorite circle glitters, so you know I love that! Some of the circles are also holo, while some are matte or metallic finish. It's a really nice mix of glitters and I am always a sucker for a nice green Lynnderella. This is part of the Lynnderella Spring Things core collection, so it's readily available for purchase, no bidding required. This is three coats of Are Those Eggs Holo? all by itself with no base. The coverage is great and you could probably do two coats if you do slightly thicker coats. I found this to be easy to apply with the dabbing method. I used one coat of Essie Good to Go on top and it was smooth to the touch. Lynnderella Blossom Was So Peachy! is another core collection polish from the Spring Things collection. 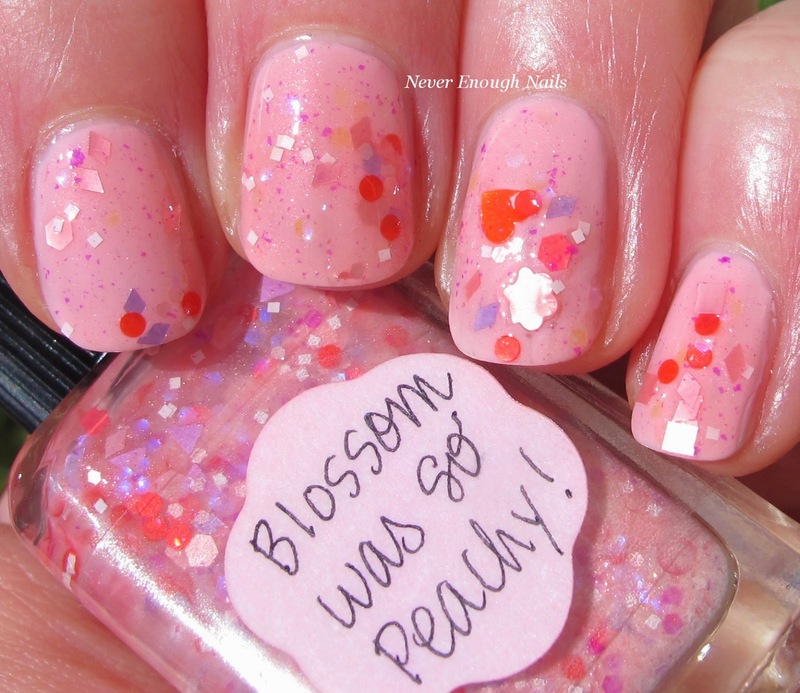 It features peach, pink, red-coral, white and lavender glitters with some iridescent blue glitters in a milky shimmery base. The blue iridescent glitters add a lot to this polish in person, but they're so hard to capture on camera, ugh! I love the mix of hearts, flowers, red circles and pretty lavender diamond glitters, it's really spring-y looking! 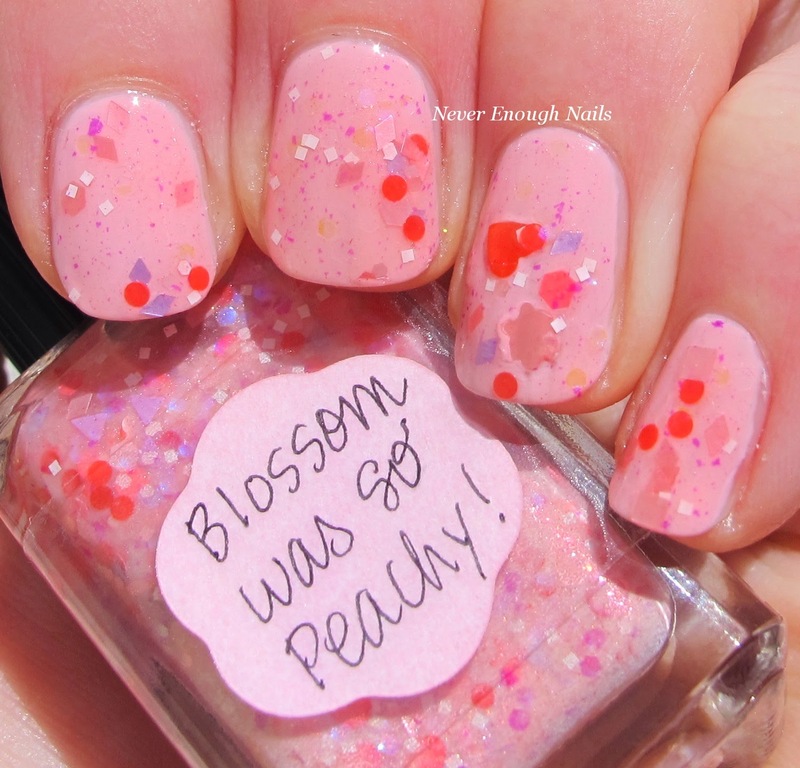 This is one easy coat of Blossom Was So Peachy! over OPI Suzi Shops & Island Hops. Blossom Was So Peachy! was easy to apply. I did push some of the larger glitters around a bit to spread them out a bit, as I got a ton of them all in one spot on my ring finger! That's what I love about glitter polishes though, the fact that each one of your nails ends up with a different selection of glitters! 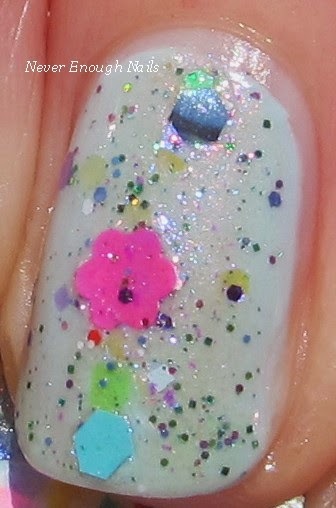 OK, as much as I hate to show you a polish you can't have, I HAD to show you this Lynnderella stunner. 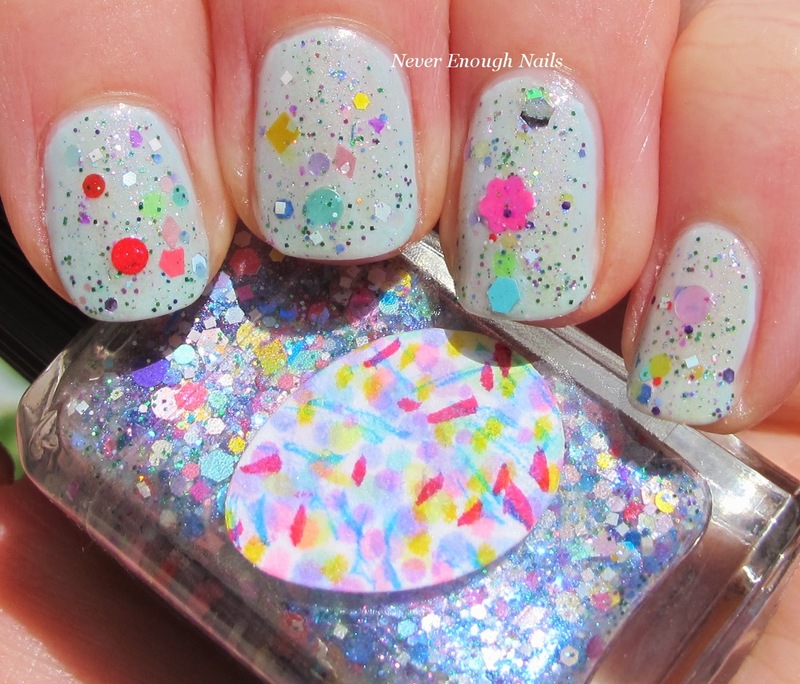 This is a Lynnderella "mystery" polish, meaning that it was kind of an early version or experiment that led to a Limited or Special Edition Lynnderella. Mystery Lynnderellas are one of a kind, but may only be a little different from the final version of the polish that was actually released. I am not sure what polish this was the pre-cursor for, but I know that I am 100% in love with it!! This unnamed mystery polish is a mix of all sorts of pastel and bright glitters in a clear-base with lots of fine pink shimmer. There are a lot of tiny multi-colored glitters in this one, aside from all of the large glitters, and that mix really makes this polish pop! This is one coat of my mystery polish over China Glaze Dashboard Dreamer. It applied really easily, no dabbing required. You can't really see the awesome pink shimmer in this, but in person it's gorgeous! While you can't own this particular mystery polish, if you like Love Lynnderella on Facebook, there are sometimes mystery polishes offered for sale there, so you can have your own one of a kind Lynnderella experiment! These are a just a few of the great offerings Lynnderella has for spring 2015! I have a bunch more to show you soon, so stay tuned! In the meantime, you can grab Are Those Eggs Holo? and Blossom Was So Peachy!, along with other Lynnderellas, at lynnderella.com and lynnderella.storenvy.com. Check out Lynnderella's blog to see the rest of the Spring Things collection.